Having started my gaming career back when Facebook was the ruling gaming platform for casual games, for a long time I saw social mechanics simply as viral mechanics – levers, which game teams could use to drive up the returning and new users to the game. But (luckily) both my perspective and the ruling platform have changed. 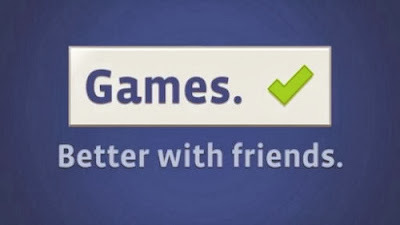 Forcing players to connect via Facebook and making them send dozens of invites and requests a day may still work for a few developers, but you’d be amazed how poorly these mechanics fit and work in mid-core titles. So instead of K-factors and virality, I want to write about true social mechanics. The kind of social mechanics that add to the gameplay, improve overall player experience and make the game feel more alive. What makes a game social is that it allows players to play with each other - or at least create an illusion that this is happening. In my mind, social mechanics should be implemented first and foremost to improve retention. As I discussed in the previous post, retention is mainly about progress. But progress is a player-specific metric. For example, I might see myself as well-progressed in a game after few weeks, but to players who have been playing the game for months, I’m still a noob. To solve the issue of progress measurability we can use social mechanics. When players collaborate with each other in a game they are bound to compare each other’s progress. Comparing progress leads to two kinds of feelings. Firstly, those players who are clearly lagging behind will want to progress and catch those ahead of them. On the other hand, progressed players will feel good about themselves and won’t want to lose the feeling of being ahead and above. The key thing to remember when designing collaboration mechanics is that collaboration between players should take place in an area of the game, where players can easily show off. Also to keep in mind is that collaboration must benefit both of the players. Every time players enter a dungeon they have to choose a player to help them. When the players have cleared a dungeon they can become friends. Having friends helping you out gives you more Pal Points, which are then used to get monsters from the Machine. Puzzle and Dragons relies mostly on one social feature: Helper. There’s no chat in P&D. No player versus player mode. No direct messaging with other people. No guilds. And no social network integrations. Yet every time player enters a dungeon they have another player as their helper - and the amount of friend requests players send to each other is huge, due to this simple mechanic. 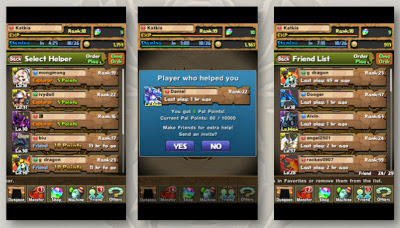 The Helper feature in Puzzle & Dragons follows the golden rule of social mechanics. game where players can show off. Before entering a dungeon, the player has to always choose a helper, which is a monster from another player. Every time players use another player’s monster as a helper, helper’s owner receives Pal Points, which are a sort of currency consumed to operate the Machine and get new monsters. The more often a player logs into the game, the higher the chance there is to appear as a helper for other players and thus earn more Pal Points. After a player has cleared a dungeon, they can add helper’s owner as a friend by sending a friend request. Players can have a specific amount of friends based on their rank. The higher the rank the more friends players can have. Using friends’ monsters as Helpers results in getting more Pal Points, as well as getting additional Leader Skill, which makes your monsters more powerful. Having active friends is thus crucial, as players can use helper only once, after which they have to wait until helper’s user logs out and logs back into the game. So in short, the social mechanics in P&D drive retention by encouraging several logins per day. Social mechanics also drive players to progress, as the better helper monster they have to offer the more often it will be used, which will result in player getting more Pal Points, which are then used to get new monsters from the Machine. Most importantly though, the design of this feature takes place in an area of the game where players can show off. I mean, it’s all about how tough of a monster you have, and giving another player a chance to play with your monster is the ultimate show off. Also, both players benefit from these social mechanics. A player who borrows a monster gets Pal Points and a player who uses other player’s monster gets much needed help to complete levels. Now we all know how Troop donation mechanic in Clash of Clans works. Once a player joins a clan they can request and donate troops. Donated troops will either help to defend a player’s village, or they can be used in attack. Despite the simplicity of the donation, it is one of the most powerful social features I’ve experienced. Donation feature in Clash of Clans is one of the most powerful social mechanics I've seen. From the game side, there’s no set number of troops a player should donate weekly. Neither is there a bonus for donating more, nor punishment for failing to donate. Yet nothing is followed by players as much as donations. Simply by enabling players to collaborate and communicate, the game allows players to create rules themselves – and with the ability to kick players off the clan, these rules are also enforced. So in practice, once a player joins an active clan, they have to donate constantly. Active clans tend to set a number of donations each clan member has to make in a week. If a player falls behind without a good reason, they get kicked out of the clan. Donation drives retention, as players not only have to constantly be training troops for donation, but they also have to progress in the game because clans naturally demand the best type of units for donation. By adding tracking to donation collaboration starts transforming into competition. Because donation follows the game’s core loop and requires progression, it is a very powerful monetization feature as well. With every monthly update there are new troops and troop levels. Because clans demand the best possible troops for donation, players tend to buy the missing resources (and speed up research times) to finish the troop upgrades. Being the first one in the clan who donates a new unit raises that player to a social pedestal and drives everyone else to hurry up their upgrades. As with P&D, Clash of Clans also follows the golden rule of collaboration mechanics. Donating troops to other players is – in a way – a show-off, as players can boast on the level of their troops as well as on how generous they are. And, in the end, both partiers benefit from donations. Those who receive them get help in battle, and those who donate improve their status inside the clan. Creating competition between players is another excellent way to have players compare their progress. The problem with competition designs in games is that most of the developers want to get players into the competition phase too early. The best way, in my opinion, is to have players first enjoying the game, then enable social mechanics by acquiring in-game friends, have them collaborate with these friends and only after that incentivize them to compete. Generally speaking, there are two types of competitions: the ones where players compete against each other individually and the ones where players form groups to compete with other groups of players. Most importantly, when designing competition features, social mechanics should be an important part of the conversation, as they intensify these features tremendously. If you want to target your top players, the leaderboard is one of the best features for that. Simply putting players into order based on how they have progressed or how they fare against other players will affect only a very small percentage of your players. Yet those who it affects tend to be the most engaged ones and will appreciate this opportunity to show off. and very easy way to broaden the effect of simple player based leaderboards. 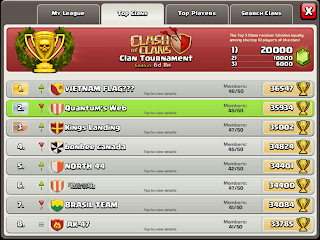 The next step is group leaderboards, such as the Clan Leaderboard in Clash of Clans. Not only does this feature affect a larger percentage of players, but putting players into teams and grading them as one will force every player in the team to do their best. By enabling direct communication such as group chat and direct messages, you basically enable peer pressure, where clan members will force lagging players to up their game while publically praising the top performers. In all its simplicity, guild wars are timed events between two groups of players triggered directly by players themselves. As with leaderboards, what makes guild wars powerful is the social aspect. Again, peer pressure plays an important role, as communication inside the guild is all about who’s active and who isn’t doing her/his part in the war. Holy Wars in Rage of Bahamut is a large scale Order battle where within a very short time frame, order members will engage in battle against each other. 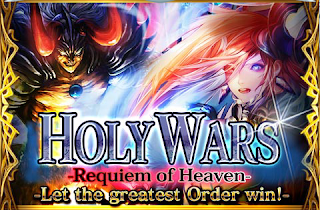 Holy War will trigger when leader of an order declares a war. Opposing Order is chosen randomly and battle notification will be sent to all members in the Order. Apart from being a timed event, guild wars also differ from leaderboards by using nomination techniques to super-engage a few players in the battling guild. By enabling guilds to nominate specific players as leaders, vice leaders, attack and defense leaders and others, you will enable the guild to run more efficiently during the event, as these few nominated players will drive the whole guild to over-engage. Essentially, raids are like guild wars, as they unify a group of players against a common opponent for a specific set of time. Yet raids differ from guild wars in two ways: Firstly, raids are against AI. Secondly, because raids are against AI, there tends to be a story element in raids, which is lacking in guild wars. Also, raids tend to award participating players with unique items based on how active they’ve been. Kixeye has pretty much mastered raid mechanics. All of their live games run periodic raid events in which players are rewarded for the level of engagement they show during the raid. By participating in the raids, players gain access to special units and parts. And yes, raids are promoted heavily, like the video above shows, which make them an essential part of the game and storyline. I know a lot of people are against my opinions when it comes to social mechanics. For them social games are all about measurable virality, where social features can be directly tied to the amount of returning players and new installs. For them, X amount of invites sent is Y amount of new installs. Yet from my experience these unmeaningful social mechanics just don't work on a long-term basis. After the first couple of spikes in metrics, you'll need to generate more and more invites for one single installation. This leads to an increasing amount of slapped-on requesting and inviting features that degenerate user experience and hinder retention. What I'm saying is that you should follow a very simple approach when it comes to social features. First start off by giving your players time to play the game by themselves. Let them learn and enjoy it and have fun, then allow them to turn social. Once they like the game and want their friends to play it as well, you can introduce social mechanics, that let players collaborate. Collaboration should benefit both of the players and occur in a game area where players can show off. Once players are collaborating you can start adding competitive element. In the end it's pretty much all about retention and social mechanics are an amazing way to improve especially long term retention.